Give your hair the boost it needs with the brand new LaCoupe Moroccan Rose Volume Loving haircare line, the first of four exciting new silicone-free haircare lines in the brand’s ecofriendly Naturals Collection. 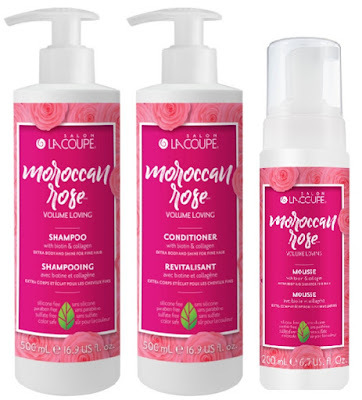 Moroccan Rose Volume Loving Shampoo and Conditioner - 500ml - $9.99 - with a strengthening, lightweight silicone-free formula crafted with a natural blend of rose oil, known for its luxe versatility, to add bounce and silkiness to lifeless hair; volume boosting biotin and collagen to promote fullness and body for fine and thinning hair; and infused with coconut water and 100% pure aloe leaf juice to leave hair feeling and looking softer and shinier along with a nutrient-rich blend of organic botanical extracts and natural moisturizers to revive and quench hair. What you will really love about them is the rich, creamy texture paired with a sweet and exotic scent to offer a truly aromatic experience in the shower while the pump dispensers keep you from wasting product! Moroccan Rose Volume Boosting Mousse - 200ml - $9.99 - a lightweight mousse that instantly thickens and boosts volume for fine and limp hair thanks to a formula infused with biotin and collagen and a rich blend of natural moisturizers and exotic oils - while the thermal protective formula shields against future damage. To make you feel even better about the line, it's free of silicones, sulfates, parabens, DEA, petroleums, propylene glycols, dyes and harsh salts. Available now Walmart and Jean Coutu stores across Canada or online at www.lacoupe.com.